Call 707-922-5654 for Free Quote! A flat panel TV also saves space in your room because you can put it flat against the wall, opening that living room space up. Don't try and move a huge television yourself. Call the e-waste removal team a Sonoma County Waste Disposal Service and let our proffesional haul away crew safely pickup and carry out a monster television so it can be hauled away and recycled. We recycle all televisions and electronic waste at a local e-waste reycling facility located on Santa Rosa Ave in Santa Rosa, CA. Old TV disposal is just a phone call away at (707) 922-5654. We can come to your home or office and haul away any TV's or computer monitors you no longer need. Unwanted electronics can pile up at your place of business. When it's time for an e-waste pickup and recycling run, Sonoma County Waste Disposal Service is available for next day pick up and disposal of any television, big or small. We specialize in all kinds of electronics removal and recycling. Your big screen television may need to get picked up and hauled to the dump for recycling. Perhaps the 35 inch Sony Trinitron TV in the den must be moved before it falls on one of the grand kids. Whatever your electronics disposal needs, we can provide quick and affordable pickup and recycling of office machines, computer electronics, microwave ovens, small kitchen appliances and gadgets, old cell phones, and pretty much any electronic device that takes batteries or plugs into the wall. If it has a cord..it's e-waste! ...and it can be recycled. We recycle all TV and LCD monitors we remove at the Santa Rosa television recycling facility on Santa Rosa Ave. All the electronics and television monitors are counted and logged in as we bring them in for disposal. The e-waste the we dump at the Santa Rosa electronics recycling center for proper disposal actually gets shipped off by the semi truck load to be recycled into new electronic gadgets and TV's. Did you know 1 ton of broken cellular phones contains over 16 ounces of gold once you melt it all down. The current price of gold at $1800.00 per ounce means the gold in 2100 pounds of old cell phones is worth nearly $29,000! The micro chips, circuit boards, and wiring in your television is recycled in much the same way. Many of the inner components of your TV may contain gold or other precious metals that can be reclaimed once the TV is dissasembled and melted down. Calling our 100% green electronics haul away service means your used electronics like a big sreen TV or old tube television sets don't get burried in the landfill where they can break and leak harmful chemicals into the ground. Keeping Sonoma County green and clean. We recycle every TV set and LCD monitor we haul away. When your LCD TV stops working or gets broken while your playing Guitar Hero you can get it hauled to the Santa Rosa TV recycler for next to nothing! Since we recycle e-waste and household electronics we can afford to offer removal of your TV set for as little as $39.00 in Santa Rosa, Petaluma, Sebastopol, Cotati, Rohnert Park, and Windsor. TV disposal is available anytime your need it. Withing 24 hours we will have our dump truck arrive at your home or business with two strong junk haulers to pickup and move your projection or large HDTV out of the home safely with no damage to your home..or your back. Just point at the television set your want removed and we will do the rest! What is in my TV that makes it so hard to recycle? Electronics recycling companys are faced with many challenges when it comes to disposing of CRT television sets and tube monitors. once the other components have been removed, the CRT (tube) itself is made of 3 parts: the glass front panel, the funnel, and something called the frit line that ties them together. The three pieces are carefully separated. The panel is coated with phosphorous, wich must be destroyed as hazardouse waste. The glass panel can then be recycled as glass. The glass panel that made up your TV screen still contains lead but it remains embeded in the glas so it is no longer harmful. Only a brave few companies will handle recycling of TV set and computer monitors. One recycling company is ERI (Electronic Recyclers International, Inc). Electronic Recyclers International® is the largest electronics recycler in North America. ERI specializes in the environmentally safe and socially responsible dismantling of electronic waste. 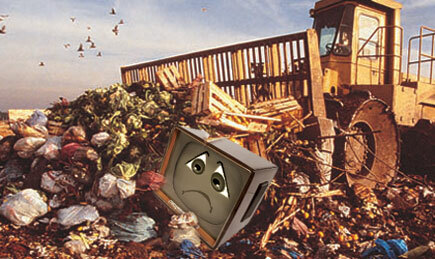 Your used TV set or old monitor doesn't want to end up in the Sonoma County landfill! The television that was with your through thick and thin....always there for you when it was time to relax on the couch. Give your HDTV a proper send off by insuring it will be treated with the care and respect it deserves. 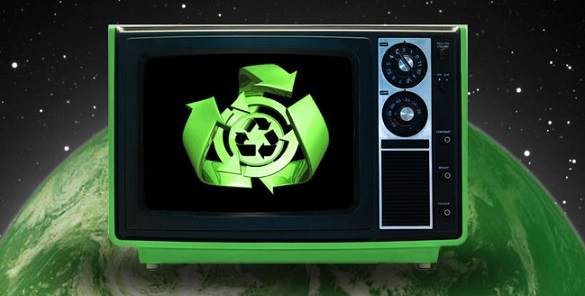 Responsible TV disposal service can be booked online or you can call us by phone 7 days a week. We are more than happy to pickup televisions and projection TV's and transport them to the proper e-waste recyling facility. 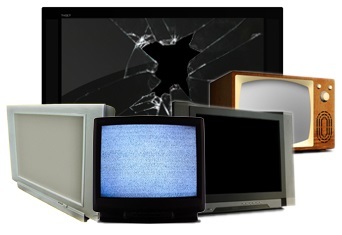 Our Santa Rosa based hauling company has been removing TV's since 2001! , Call us for next day household electronics pickup service anywhere in Sonoma County. We can provide quick and affordable couch removal, mattress pickup, appliance disposal, furniture pickup service, yard waste disposal, wood and scrap lumber recycling, and concrete removal anywhee in Sonoma County, CA. Call 707-922-5654 for a Free Quote! Price is for pickup, removal, and recycling of up to a 40 inch TV monitor outside in Santa Rosa, Rohnert Park, Cotati, and Winsdor CA. You may be wondering how they recycle a TV once it's taken away from the Santa Rosa dump electronics drop off section to who know where. 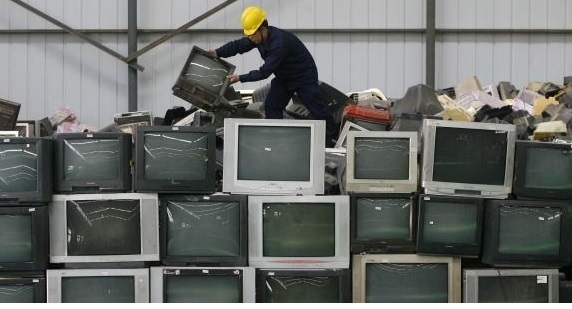 Here is how recycling of a television works: There are over 200 million bulky television sets waiting for removal in American homes having become obselete. Recycling electronioc waste is a difficult job but old televisions and computer monitors are extra hard to proccess. 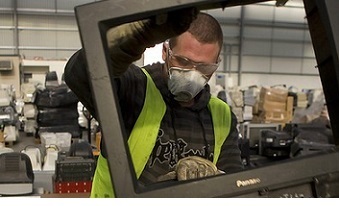 Recyclers start by stripping down and dismantling each television set or LCD monitor. The components in the CRT TV monitor such as copper, wood, plastic can be sold on the commodities market and used in new products. The circuit boards go to a special company that harvest the platinum, gold, and other precious metals. 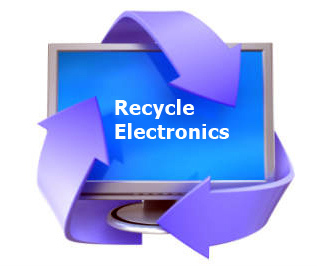 Electronics recycling in the Santa Rosa area is just a phone call or click away. We offer low cost pickup and recycling of your used electronics in Petaluma, Sebastopol, Forestville, Rohnert Park, Cotati, and Windsor. We can pickup and remove your broken or outdated computer equipment, office machines, fax and printer copier, HDTV, kitchen small appliances, used cellular phones, radios and stereo equipment, blow dryers and curling irons, and more. Disposal of electronic waste by a green hauling company means your computer equipment or CRT monitor won't end up in the landfill where it can leak pollutants into the ground. We have been providing 100% green e-waste recycling pickup service since 2001! 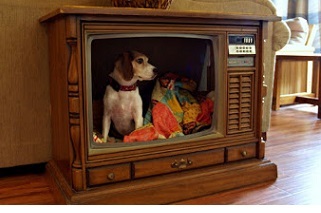 There is more than one way to recycle a television set! That is not how we normaly use the old TV's we haul away. Big sreen TV's are bulky and hard to move around. Many of these HDTV's that are 50 or 60 inches are waiting for disposal in garages and living rooms around Sonoma County. We have no problem removing a big screen television from your home or back yard. The strong and experienced junk haulers at Sonoma County Waste Disposal Service have removed 100's of large big screen projection TV's in and out of homes without scratching the walls or doorways. We can provide next day projection TV removal and recycle service anywhere in the Santa Rosa area including Petaluma, Rohnert Park, Sebastopol, Cotati, Windsor, and Forestville, CA. Affordable prices on removal of e-waste from television sets to hair dryers. We also remove large appliances such as your refrigerator, stove. microwave oven, or washing machine. Hauling junk and debris away for Sonoma County households since 2001. We are here for your junk hauling needs 7 days a week. Call a 100% green junk removal company and let us save you money by reycling your unwanted items! Contact us at: (707) 922-5654 or schedule your junk removal online. Time to upgrade to a flat screen television? That is a good idea for many reasons but one is that it will be alot lighter than your old TV. The LCD TVs of today save alot of energy because they are alot easier to move around! 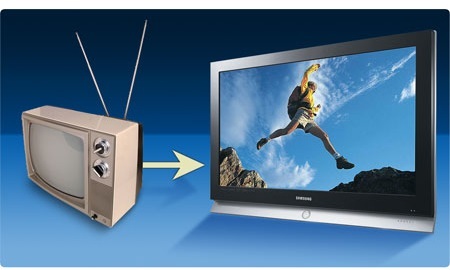 When your new plasma flat screen TV arrives, call us at (707) 922-5654 for removal of your old TV or electronics. E-waste recycling is one thing we are good at. Television disposal service is available 7 days a week in Santa Rosa, Petaluma, Rohnert Park, Windsor, and Sebastopol, CA. The 32 inch Sonoy Trinitron may still give you a great picture, but it weighs about 300 pounds. That is more TV than any human can carry. ..but guess what: it won't fit though the doorway on a hand truck dolly either...no mater how you try it. A television the size and weight of a used Sony Trinitron 32 inch TV must be carefully removed and carried out of the home by a pair of trained proffesional e-waste pickup experts. You can call us for next day pickup and recycling of your old television or broken LCD TV. You may have got a little too excited with the Wii Tennis video game and the controller ended up sticking out of the 60 inch flat screen TV. It happens! (we have removed over 25 confirmed flat panel TV video game accident casualties). With the price of new plasma TV's going down every year, it's time you upgraded to a nice HD TV. Check out the deals at Wal-mart and you will be suprised how cheap you can get a 50 or 60 inch television. • Movie Theaters Sonoma Co.
• Can I Donate My Couch?